Tallulah Winkelman is an ex-wife of Abe Simpson. At "Take your parent to work day", Abe met Mr. Burns' mother, and after work the two went off together and got married, meaning Homer had a new brother - Mr. Burns. 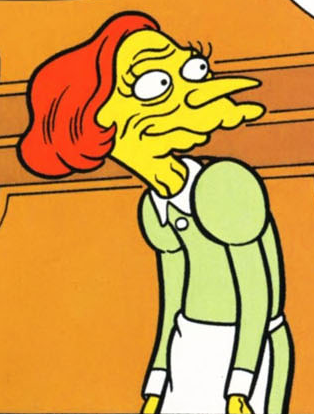 However soon after Smithers told Abe that he hadn't actually married Burns' mother, but an actress named Tallulah Winkelman, who played Ms. Burns at "Take your parent to work day". Abe divorced her and Burns stopped treating Homer as his brother. Modified on February 5, 2013, at 18:37.